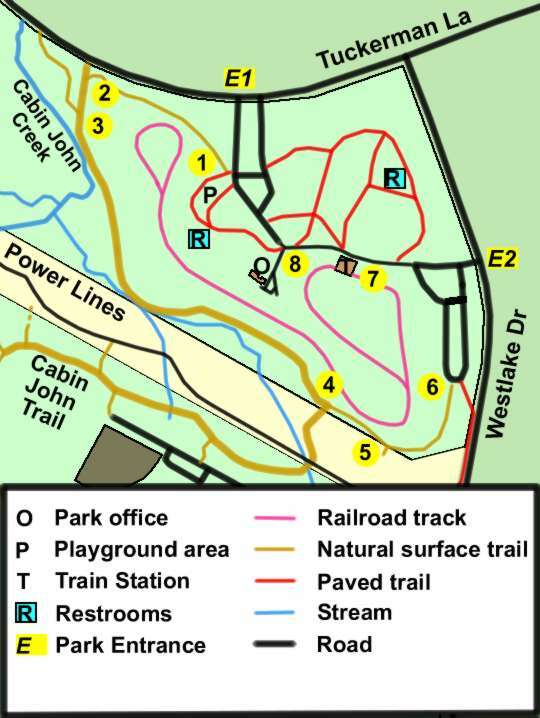 The walk starts from the playground section of Cabin John Regional Park near the Tuckerman Lane entrance road. Locate the first asphalt trail leading to the right into the playground area as you drive into the park. Notice what appears to be a dirt service road at the asphalt trail leading to the playground equipment. You may see mulch piles on the right of the service road. Follow this road a short distance until it becomes a narrower trail curving to the left and following Tuckerman Lane down the hill. At the bottom of the hill the Cabin John trail intersects from the right. Turn left to follow the Cabin John trail as it follows the Cabin John Creek. A trail intersects from the right after a short distance. Continue straight on the present trail. After a considerable distance the Cabin John trail turns to the right to cross the power lines. Continue straight on the present trail. Notice the bench on the left in the picture at this trail intersection. An opening to the power line section appears on the right. Continue straight on the present trail. The natural surface trail ends at the parking area. Turn left and follow the parking lot up the hill and turn left upon reaching the paved service road. The service road passes the train station on the left. A service road leads to the park office on the left. After passing this service road turn slightly to the right to enter the playground parking area and the end of the walk.